“I saw the flyers and thought they were junk mail,” the 18-year-old said. He said the contents of the flyers didn’t have a place in Penrith. 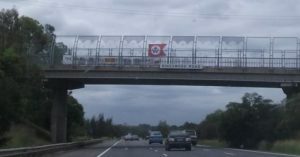 After receiving about 10 in the past few months, he saw the banner while driving on the M4. “I remembered the flyers when I saw the flag,” he said. On the group’s website, its NSW co-ordinator is listed as Chris Smith. The Press contacted him by email and he responded to questions. Mr Smith said the group hoped to educate white Australians about “what is really going on in the world”. Asked how many members the group had, Mr Smith refused to comment. Looks as if Mr. Omar Hamwi didn’t do his homework regarding the Alliance. 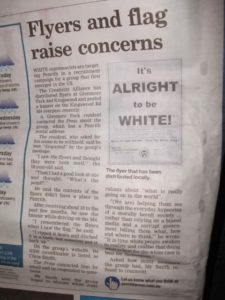 We are not a “White Supremacist” organisation. @ jb: You claim there is nothing of substance and that’s all rhetoric, yet I severely doubt you have ever considered saying the same about Aboriginal rights, Gay rights or to the Iman at the Lakemba Mosque, have you? No. In your big wide multicultural world, that would be considered “racist” and “homophobic” of you. 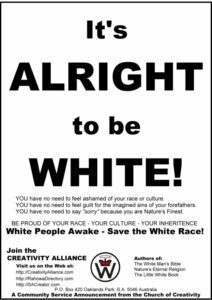 The problem with your kind is that you have been cowed by government, media and education systems to feel ashamed of being White, and that is precisely what this flier is meant to address. 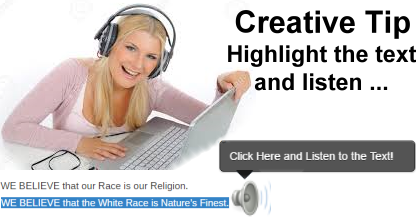 The refusal of the right to have pride in oneself, race and heritage when applied to non-Whites is considered to be another method of genocide, why is that not the case when applied to White people of European heritage? Why is the cultural and racial assimilation, and eventually supersedence of White culture and White ethnic homogeneity by imported races and cultures who often not only want to alter Australia, but openly profess their hatred for White people considered to be a good thing? You brother, are in self denial of your own ongoing genocide. If you really wish to commit suicide, I suggest you do it quietly and don’t try to take the rest of us with you.